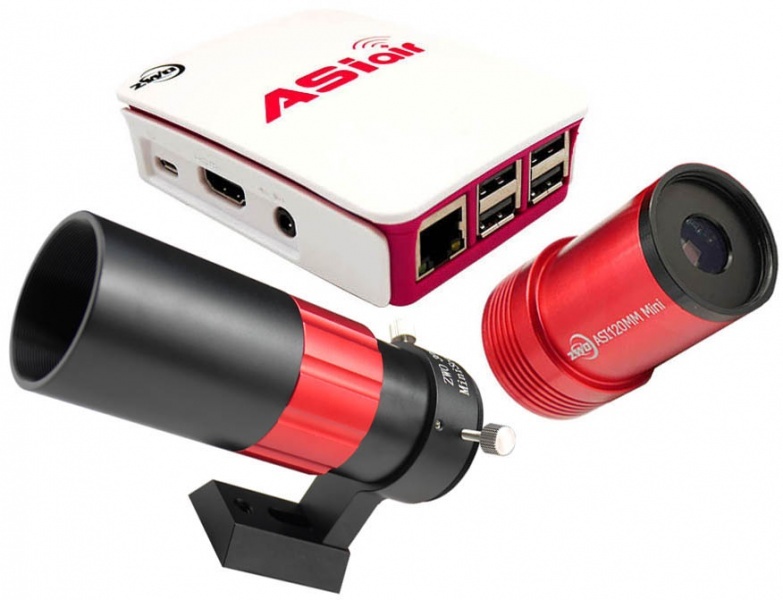 ASIAIR is a smart WiFi device that allows you to control all ASI USB 3.0 cameras, ASI Mini series cameras, and an equatorial mount to do plate solving and imaging with your Android phone, tablet or iPad when connected to ASIAIR via WiFi. For those new to astro photograpy, here is little bit of explanation what plate solving is. It is a way of defining the actual direction of the telescope when an image has been taken. A camera takes an image of the night sky, then a software will analyze the star patterns and by comparing them with data from various star catalogues it will "understand" where it is pointed to. Then this information (usually repeated in various directions) can be used in various ways, but most frequently it is being used to calibrate / align the mount, so that you can use it to point at a subject of your choice without need for "star hopping", use of a finderscope, etc. It can also use this information to improve the pointing accuracy of the mount. Basically it's a very cool and useful feature.